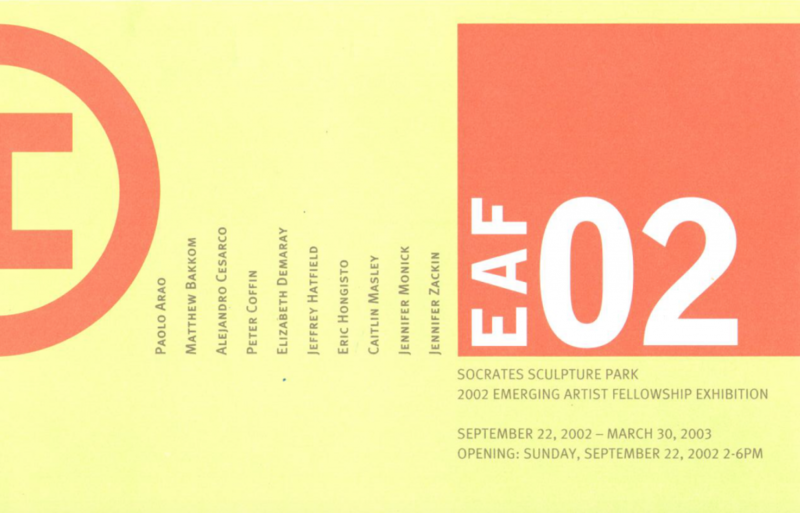 Socrates Sculpture Park is pleased to announce the opening of EAF02: 2002 Emerging Artists Fellowship Exhibition, featuring works by Paolo Arao, Matthew Bakkom, Alejandro Cesarco, Peter Coffin, Elizabeth Demaray, Jeffrey Hatfield, Eric Hongisto, Caitlin Masley, Jennifer Monick, and Jennifer Zackin. For over fifteen years, Socrates Sculpture Park has been committed to giving emerging artists a chance to work outside the confines of a traditional studio environment in a community that is supportive and encouraging, and to follow new directions in their work, realize ambitious projects, and exhibit in an open, professional forum. The Park is a laboratory where experimentation and innovation expand, reinvent and redefine the tradition of art in public spaces. 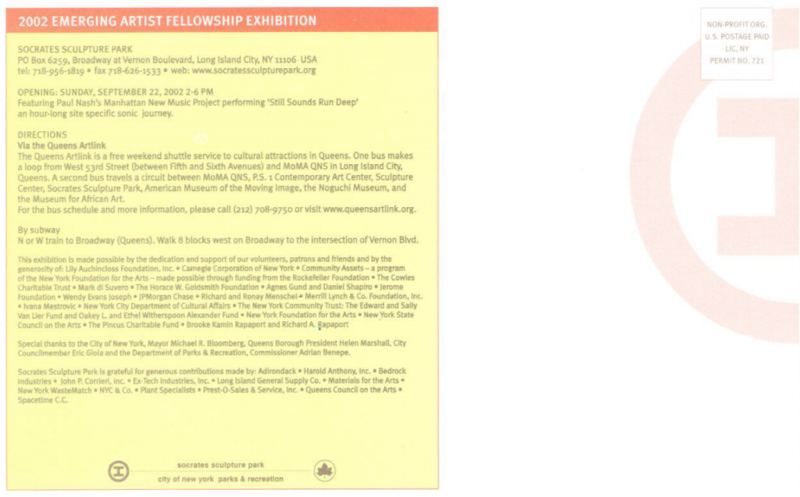 The opening reception will feature New York City jazz-composer Paul Nash’s Manhattan New Music Project performing ‘Still Sounds Run Deep’. This hour-long site-specific sonic journey will include top New York City jazz performers deployed among the sculptural installations acting, reacting and interacting with the audience and each other. This exhibition is made possible by the dedication and support of our volunteers, patrons and friends and by the generosity of: Lily Auchincloss Foundation, Inc.; Carnegie Corporation of New York; Community Assets — a program of the New York Foundation for the Arts — made possible through funding from the Rockefeller Foundation; The Cowles Charitable Trust; Mark di Suvero; The Horace W. Goldsmith Foundation; Agnes Gund and Daniel Shapiro; Jerome Foundation; Wendy Evans Joseph; JPMorgan Chase; Richard and Ronay Menschel; Merrill Lynch & Co. Foundation, Inc.; Ivana Mestrovic; New York City Department of Cultural Affairs; The New York Community Trust: The Edward and Sally Van Lier Fund and Oakey L. and Ethel Witherspoon Alexander Fund; New York Foundation for the Arts; New York State Council on the Arts; The Pincus Charitable Fund; Brooke Kamin Rapaport and Richard A. Rapaport. Special thanks to the City of New York, Mayor Michael R. Bloomberg, Queens Borough President Helen M. Marshall, City Councilmember Eric Gioia and the Department of Parks & Recreation, Commissioner Adrian Benepe. Socrates Sculpture Park is grateful for the generous contributions made by: Adirondack; Harold Anthony, Inc.; Bedrock Industries; John P. Corrieri, Inc.; Ex-Tech Industries; Long Island General Supply Co.; Materials for the Arts; New York WasteMatch; NYC & Co.; Plant Specialists; Prest-O-Sales & Service, Inc.; Queens Council on the Arts; Spacetime C.C.